This project started several years ago as a way to showcase images and articles published about the Space General Corporation Lunar Exploration Suit, Model MK 1. Over the years, however, images of toys and collectibles have popped up that make this particular footnote in the history of space exploration even more intriging. 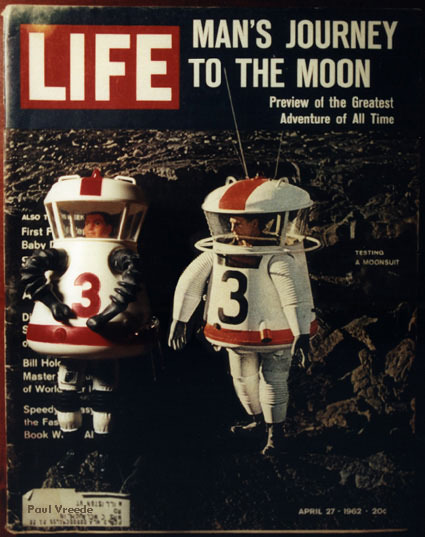 I was originally inspired to write about the Moon Suit by the Major Matt Mason accessory and its links to the Life magazine cover and article. The Moon Suit was once again brought to my attention through another hobby of mine, collecting old magazines and books about space exploration. Mentioning the Moon Suit on the various Major Matt Mason lists brought further information as detailed in the pages prior to this one. Thus the trail leads us here, to the various toys and collectibles created in the Moon Suit's image. This is by no means a complete listing as new images and information are waiting out there to be found. Rather it is a living document on this rather odd solution to an interesting problem: how does man survive on the moon? The Moon Suit appears as several tin robot/astronaut toys in the sixties, as well as a character in several Marx playsets as a small plastic figure. The collector's coin is perhaps the oddest collectible. Enjoy! The Marx made figure came in several space playsets, and it appears that there were two that could be based on similar designs. I've included several images...the figures are about 2 1/2 inches in height and could come in several colors and combinations. I've only seen the suit in silver or white plastic, however, so it may only have been included in the earlier playsets. Here is the Moonsuit most remembered by space toy enthusiasts! The moonsuit could be bought with or without a Major Matt Mason figure. Here's a comparison of the Mattel suit to the actual item (from the cover of Life Magazine...image and manipulation by Paul Vreede). I came across this oddball in an eBay auction. I ended up getting outbid on the coin and the description was very lacking so I don't know its dimensions or origin. It's still interesting, though, that someone somewhere decided that a commerative coin needed to be made! It has "Made in Guatamala" and "By Peter Pan" on the face, so it may have been a peanut butter giveaway.